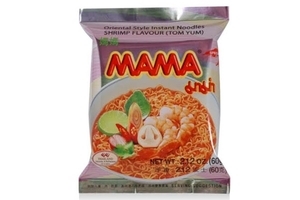 Mama Oriental Style Instant Noodle Tom Yum Flavor (Shrimp Flavor) in 2.1oz (60g) Pack. Mama Instant Noodles Shrimp Tom Yum Flavour. A spicy hot & sour noodle containing aromatic lemon grass & kaffir lime leaves, and galangal. This Tom Yum recipe has a nice spectrum of tastes and aromas with the red chili oil droplets on top of the soup. You can jazz up this instant noodle with lots of delicious ingredients. Recommend adding shrimps, Tofu and vegetables to this authentic Thai flavors tasting broth. Very easy to prepare, simply put the noodles and condiments in the bowl, pour in 1 1/2 cup (350 ml) of boiling water, cover the bowl for 3 minutes and now delicious and appetizing noodle is ready to served. Product of Thailand. Literally, the words tom yum are derived from two Tai words: tom and yam. Tom refers to boiling process, while yam refers to a kind of Lao and Thai spicy and sour salad. amazing soup. for instant noodles it's the closest thing you'll find to the real thing.